Vigan Ukoy is also sold along side the popular Vigan empanada at the Vigan Empanadaan under the bell tower of St. Paul Cathedral. This ukoy may be less popular but it is equally as good as the Vigan empanada. Vigan ukoy is crispy shrimp fritter made up of small shrimps and glutinous rice batter and served in Ilocos cane vinegar with garlic, onion and hot chili. 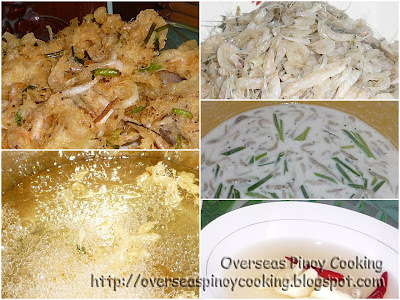 The ukoy is fried in a wok of hot cooking oil, to achieve that extra crispiness, the ukoy batter is slowly poured on the hot cooking oil in a circular manner. This method will result a crispy thin airy fritter compared to the solid patties of a regular ukoy. Here is the recipe. In a bowl mix glutinous rice flour add dash of salt and pepper to taste. Blend in the beaten egg and 1 1/2 cup of water until a smooth batter is produced. Add in shrimp and spring onion, mix thoroughly. Heat about 2 to 3 cups of oil in a wok. Using a soup ladle scoop about 1/3 cup of the shrimp batter mixture and pour in circular motion into the heated oil. Fry one scoop at a time flip once the bottom turns to golden brown. Fry until crispy and golden brown. Remove from wok and drain on a paper towel. Serve with Ilocos vinegar, crushed garlic and onion dipping sauce.